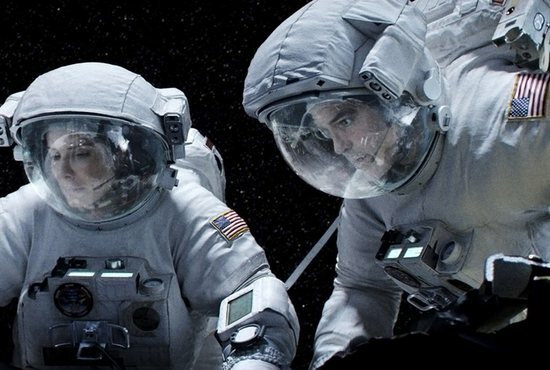 Sandra Bullock and George Clooney star in a scene from the movie “Gravity.” CNS photo/Warner Bros. Note: The following article reveals the full plot line. But trouble quickly comes. The debris from a series of shattered satellites, we learn, is moving rapidly toward the craft. Before the crew can fully brace for impact, the space station is struck and catastrophically compromised. Most of them are killed instantly, but two figures — mission commander Matt Kowalski (George Clooney) and Ryan Stone (Sandra Bullock) — are left alive but in desperate danger. After a series of unfortunate accidents and coincidences, Kowalski is left clinging to Stone as she clings to the remains of an abandoned Soyuz Soviet space station. It becomes clear that Stone can survive only if Kowalski detaches himself from her. Despite her tearful protestations, he lets go and drifts lazily off into space and certain death. The last word we hear from him — and it is the first hint of the movie’s spiritual ambitions — is his serene comment that the Ganges (River that borders India and Bangladesh) looks beautiful with the sun glinting off of it. As he performs the supreme act of love (“greater love hath no man than to give his life for his friend.”), he contemplates one of the most religiously charged locales on the planet. Freed from Kowalski, Stone makes her way into the Soyuz and finds the pod on which she hopes to fly to a Chinese vehicle, which will finally take her home. But to her infinite chagrin, she discovers that there is no fuel in the Soviet pod and that she is, accordingly, surely doomed. With tears and much hesitation, she commences to pray, though she admits she doesn’t really know how to pray, and at this point, we notice an icon of St. Christopher on the instrument panel of the pod. Her prayer apparently unanswered and resigned to her demise, she then allows the oxygen to run down, so as to commit suicide by hypoxia. But just as she starts to drift into unconsciousness, Kowalski, to our infinite surprise, suddenly opens the hatch and bursts in. With bravado and confidence, he switches on the lights, turns on the oxygen and shows Stone how to activate the pod. However, just when we thought that the day had been saved by this deus ex machina, we discover, in the next scene, that Stone is still alone. Had Kowalski’s appearance been just a hallucination produced by oxygen deprivation, or had it in fact been a visitation from a figure now in heaven, or was it, perhaps, the latter by means of the former? At any rate, she took it to be a link to the transcendent, for she immediately asked Kowalski to communicate her love to her 4-year-old daughter who had died some years before in a freak accident. None of the vaunted technology that she had mastered had ever allowed her to contact her beloved daughter, but now she had found, precisely through a figure who had manifested perfect love, a route of access, a means of communication to a realm beyond this one. Inspired by her supernatural visitation, Stone summons the courage to fly to the Chinese spacecraft and hurtle on it back to earth. While she navigates the vessel, she sees, over its instrument panel, a little statue of the smiling Buddha — the third explicitly religious symbol in the film. After splashing down in an unidentified body of water, Stone crawls to shore, grasps the wet sand in her hands, and mutters the final word of the movie: “Thanks.” The one who had admitted that she didn’t know how to pray utters, at the end, a beautiful and altogether appropriate prayer. The technology which this film legitimately celebrates is marvelously useful and, in its own way, beautiful. But it can’t save us, and it can’t provide the means by which we establish real contact with each other. The Ganges in the sun, the St. Christopher icon, the statue of the Buddha, and above all, a visit from a denizen of heaven, signal that there is a dimension of reality that lies beyond what technology can master or access. The key that most effectively opens the door to the reality of God is nothing other than the kind of self-forgetting love that George Clooney’s character displayed, for God, as the first letter of John tells us, is love. In and through that love, which permeates and animates the whole of the creation, we find connection to everything else and everyone else — even to those who have passed from this life to the next. Father Barron is the founder of the global ministry, Word on Fire, and the rector/president of Mundelein Seminary. Word on Fire will be releasing “The New Evangelization” documentary this Fall. Learn more on the Word on Fire website.